We've seen how various OAuth2 flows allow clients to get delegated access to resources on behalf of the users who own the resources. Modern software is built more and more with distributed architecture in mind and service to service communication is a common scenario and when it comes to security we want to know our options. OAuth2 already describes one flow specifically dedicated to service to service scenarios called Client Credentials Grant that boils down to the following: the client (a calling service) sends its credentials to the token endpoint of the identity providers (authority) and receives a token back that it includes with a call to a target service. Pretty straightforward and there are a lot of uses for it. However, it has one drawback - we lose the security context in which the calling service was invoked originally. Well, in many cases this may not be an issue at all. For instance, internal tasks processing data, calculating stats, etc. that should not be bound to the security context of a particular user. But there are other tasks that result in data changes triggered by someone's deliberate action or maybe report generation tasks where we often want to apply security constraints to guarantee that the data gets modified or exposed within the allowed policy. In other words, we would like to preserve the security context of the caller who initiated the operation. This is where the on-behalf-of flow defined by the OAuth2 Token Exchange extensions can be really handy. 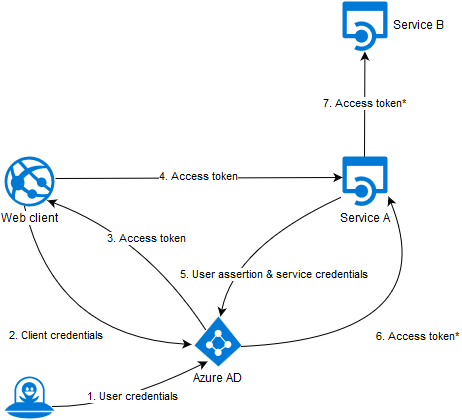 Service A accepts an access token obtained as a result of some OAuth2 or OpenID Connect dance on the web client and uses it as a user assertion when it makes a call to the authority (in our case Azure AD) to obtain its own access token (*) for the downstream service B. This new access token will carry the same security context as the original one but it will be issued specifically for Service A to call service B.
I've created an ASP.NET Core test solution that reproduces the scenario described on the diagram. Please check it out on your own and I will just highlight the important bits related to the on-behalf-of flow. The important property that we should pay attention to is SaveToken that allows us to save the original access token in the AuthenticationProperties so we can re-use it later as a user assertion. var userName = httpContextAccessor.HttpContext.User.FindFirst(ClaimTypes.Upn)?.Value ?? Notice the urn:ietf:params:oauth:grant-type:jwt-bearer assertion type and the way we get the original token using the AuthenticationManager. We use IHttpContextAccessor to get access to HttpContext in ASP.NET Core (there is not static Current property anymore) and we access the AuthenticationManager from the context. By default all applications in Azure AD has a 'user_impersonation' delegated permission (defined in their manifests) that can be assigned to other applications. You can define your own permission, of course. Let's have a closer look at the actual call to the token endpoint. Notice the value of the aud claim. It indicates the target audience of the original token. appid claim contains the value of the client ID of the web application. We see that the aud and appid claim values have changed. 'b13f8976-d003-4478-b9d2-a9ff0ee8b382' is the client ID of Service A.